I finally figured out what to do with my Lillian Academy cell phone charms that RightStuf gave me with my Maria-sama ga Miteru pre-orders. (My phone doesn't have a charm hole.) Behold! Marimite USB flash drive charms. 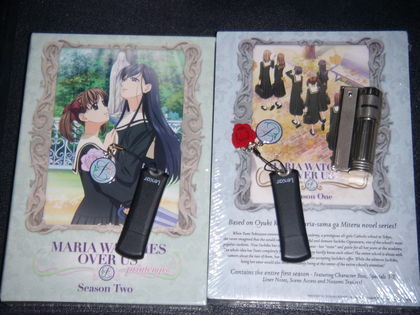 Marimite DVDs, Lillian Academy cell phone charms, and my Reki-type lighter. Yeah, they do look fruity as all Hell. Also pictured for no reason is my Austrian Imco lighter, which is sure to be the envy of all true Haibane Renmei fans, even if they don't smoke. Unfortunately, contrary to true Haibane fashion, I was not able to acquire it secondhand.